Peter Polansky and Bianca Andreescu lost their final-round French Open qualifying matches on Friday – but one of them survived and will play in the main draw. Polansky, as he did when he lost in the final round of qualifying at the Australian Open in January, was one of four lucky losers to enter the men’s main draw after Hyeon Chung, Andrey Rublev, Filip Krajinovic and Nicolas Kicker withdrew or were forced out as was the case with Argentine Kicker who was found guilty of match-fixing offences dating back to 2015. Because of his high ranking among final-round losers in the qualifying – No. 125 – Polansky had a chance for a lucky loser slot and Andreescu did not because her ranking is No. 201. Both players had eventful matches Friday – Polansky losing in two close tiebreak sets – 7-6(1), 7-6(3) to Josef Kovalik of Slovakia – and Andreescu rallying from a slow start, partly due to indigestion problems that arose during the warm-up, before losing 6-3, 7-6(9) to Richel Hogenkamp of the Netherlands after holding two set points in a rambling, madcap second-set tiebreak. Their man managed to save a set point trailing 5-4 in the first set but was outplayed in the ensuing tiebreak, with the 25-year-old Slovak pulling out a service winner and an ace to stretch his lead to 4-1 and take charge for good. After his victory over Pedja Krstin of Serbia of Thursday, Polansky had described Kovalik as being “robotic.” That description did not quite apply in reality as the Slovak displayed an uncanny ability to dazzle with drop shots – sometimes with the coup de grace finishing shot being a lob. He also generally hit flatter and with more penetration than Polansky. It was a hot day – 27 degrees – and Polansky changed his Lululemon shirt four times. The match hit its apex of excitement in the second set tiebreak. With Kovalik leading 3-2 and up a mini-break, he hit a drop shot that Polansky reached and made a semi-miraculous get – sliding forward and nudging the ball up as he lost his racquet and tumbled to the ground. The ball teetered on the top of the net and dripped over for a winner as the crowd went wild. That could have discouraged Kovalik who complained to the umpire that he thought it had been a double bounce. But the Slovak won the next four points in a row – two of them on points initiated with drop shots. The ultimate point was a missed forehand passing shot by a Polansky under pressure. The handshake at the net was cordial, with both players seeming to acknowledge they had engaged in a well-played and entertaining encounter. A lot of the sting was taken out of the loss when Polansky later learned he was a lucky loser and will meet No. 87-ranked Pierre-Hugues Herbert of France in the main draw. There’s also the matter of guaranteed first-round loser’s prize money of 40,000 euros or $60,500 Canadian. 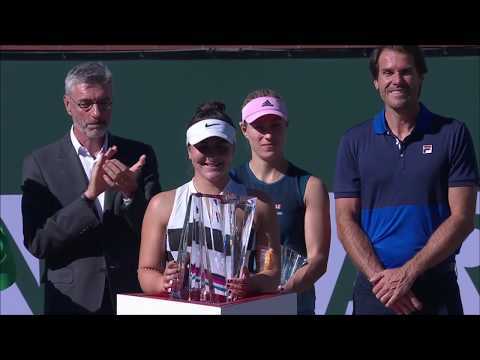 The Andreescu – Hogenkamp match got off to a patchy start and it looked as if something could be wrong with the 17-year-old Canadian when she squatted down for a few second after a point in the fourth game. Trailing 3-2, she asked for medical attention and a doctor and a trainer came on attended to her. The doctor gave her what Canadian Fed Cup captain Sylvain Bruneau later described as a “little sachet” of medicine and she continued. After two more games and some spotty play, Andreescu briefly spoke to the umpire and used the word “washroom” when requesting to leave the court. She went off and didn’t return for the longest time – more than 10 minutes. But when she did she looked more positive and committed. She won a game to get back to 5-3 but Hogenkamp managed to serve out the set to 6-3 from a love-30 deficit in the final game. Much like Kovalik against Polansky, Hogenkamp was successful using drop shots as a frequent tactic against Andreescu. Andreescu, above in a gesture of frustration in the first set, played better in the second set and led 3-3, 30-15 when rain came and delayed the match more than 90 minutes. When the players returned, Andreescu took a 5-3 lead and had a set point at 6-5 before the match proceeded to a tiebreak. And quite a wild tiebreak it was – with Hogenkamp taking a 5-1 lead as rain began to fall. On that last point Andreescu had stopped playing because she thought a shot by the 26-year-old Dutchwoman was out. It turned out to be good and things looked extremely bleak for Andreescu as the players changed ends. Both of them, but mostly Andreescu, seemed dubious about continuing in the drizzle…but play on they did. Two points later Hogenkamp led 6-3 – three match points – but got a little tight and made three unforced errors. Andreescu got back to 6-all and had a set point at 7-6 before volleying long and at 9-8, losing a point that started with yet another Hogenkamp drop shot. Hogenkamp wrapped up the victory two points later and advanced to play in the main draw at the French Open for the second time in her career. It was a tough loss for Andreescu who failed to play up to the level of her scintillating 6-1, 6-3 victory over Viktorija Tomova of Bulargia on Thursday. “I’m disappointed about Bianca today because she really played well the first two rounds,” said Bruneau. “She was bothered by an indigestion problem – and then she came back after the interruption she had her chances but didn’t take them. There was no issue associated with the wrap and tape on her legs. “She had an indigestion problem and was able to take care of it by taking some sachets. Bruneau added that, based on her form in her first two matches, he was confident Andreescu was a superior player and had an excellent chance to beat Hogenkamp. Unfortunately it’s always the way with tennis – people remember the last match and that’s almost always a loser. But Andreescu won’t be 18 until June 16th. She has impressed a lot of people with her powerful, efficient and all-round game. Hopefully the loss to Hogenkamp serves as a learning experience for brighter days ahead. Denis Shapovalov will complete his first tour of all four of tennis’ Grand Slam tournaments when he plays No. 58-ranked John Millman of Australia on either Monday or Tuesday. Speaking with journalists at the French Open on Friday, the 19-year-old current world No. 26 professed to be amazed that Rafael Nadal won his first Roland Garros at such a young age. Starting the year at No. 51, Shapovalov has basically cut his ranking in half and now stands at No. 26. There are great expectations for the resident of Richmond Hill, Ont., and even talk that he could win a Grand Slam sooner rather than later. He rejected that suggestion, preferring to compare himself to current world No. 3, 21-year-old Sascha Zverev of Germany. “Obviously I don’t expect such crazy results from myself this early on,” he said. “Hopefully a couple of years from now I can be a contender for the titles, kind of like Zverev is right now. Exactly two years younger to the month (April), Shapovalov has played Zverev twice – both in Masters 1000 semi-finals. At the Rogers Cup last summer in Montreal, Zverev won 6-4, 7-5 as he also did earlier this month in Madrid by a 6-4, 6-1 score. Paris is known as the City of Light – but it surely also could be known as the City of Love. This mailbox, just dripping with it, is in the rue de Grenelle in the tony Paris 7ieme. NOTE: No blogs on Saturday and Sunday – back on Monday.